Analysis: Is first lady the president's secret diplomatic weapon? WASHINGTON (CNN) -- What can the first lady accomplish when she accompanies her husband on his first trip to Europe? She can play a role in the rebranding of America. First lady Michelle Obama can play a role in rebranding America, CNN's Bill Schneider says. President Obama has star power. We saw it when he traveled to Europe during the campaign. So does the first lady: When Michelle Obama accompanies her husband overseas this week for the G-20 summit, it's likely to double the wattage. Obama remains a figure of hope to the world. But he is not immune from criticism. His policies have been under attack abroad as well as at home. "He talks about a large stimulus campaign by Americans. All of these steps, their combination and their permanency, is a way to hell," Czech Prime Minister Mirek Topolanek said. "It was a crisis that was created and spread throughout the world due to the irresponsible behavior of white people, blue-eyed people, that thought they knew everything but are now showing they knew nothing," Brazilian President Luiz Inacio Lula da Silva said. Obama's mission is to rebrand the United States as a force for change and hope in the world, just as John F. Kennedy once did. First lady Jacqueline Kennedy was an important asset to JFK. Her charm and sophistication were a sensation overseas. Michelle Obama also embodies a new American brand: diversity and accomplishment. "We're at a time when we're going to have to try a lot of things. Some of it won't work; some of them will," the first lady said. 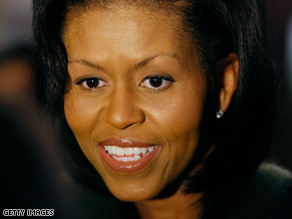 In London, England, Michelle Obama will visit a school for underprivileged girls, many of them learning to speak English. She is likely to make a strong statement about women's rights, as she did recently when she brought together "Women of Courage'' at the White House. "The difference between a struggling family and a healthy one is often the presence of a strong woman or women at the center of that family," she said. The first lady will also visit the Jewish quarter of Prague, in the Czech Republic, which symbolizes the tragic history of a community that found success and influence in the United States. An African-American first lady will pay tribute to women and Jews. It's the new face of America.